The major improvement came during a Boot Camp for Windows Phone 8.1 App development organised by Microsoft Indian Ocean Islands in cooperation with Emtel at the Emtel World, Ebene. Apart from learning bits and pieces regarding Universal Apps I took the opportunity to get in touch with Arvin Lockee, Sales Executive - Data, during our lunch break. And this really kicked off the whole procedure. Prior to get access to the Emtel data centre it is requested that you provide full name and National ID of anyone going to visit. Also, it should be noted that there was only a limited amount of seats available. Anyways, packed with this information I posted through the usual social media channels. Responses came in very quickly and based on First-come, first-serve (FCFS) principle I noted down the details and forwarded them to Emtel in order to fix a date and time for the visit. In preparation on our side, all attendees exchanged contact details and we organised transport options to go to the data centre in Arsenal. The day before and on the day of our meeting, Arvin send me a reminder to check whether everything is still confirmed and ready to go... Of course, it was! As I'm coming from Flic En Flac towards the North, we agreed that I'm going to pick up a couple of young fellows near the old post office in Port Louis. All went well, except that Sean eventually might be living in another time zone compared to the rest of us. Anyway, after some extended stop we were complete and arrived just in time in Arsenal to meet and greet with Ish and Veer. Again, Emtel is taking access procedures to their data centre very serious and the gate stayed close until all our IDs had been noted and compared to the list of registered attendees. Despite having a good laugh at the mixture of old and new ID cards it was a straight-forward processing. The ward was very helpful and guided us to the waiting area at the entrance section of the building. Shortly after we were welcomed by Kamlesh Bokhoree, the Data Centre Officer. He gave us brief introduction into the rules and regulations during our visit, like no photography allowed, not touching the buttons, and following his instructions through the whole visit. Of course! Next, he explained us the multi-factor authentication system using a combination of bio-metric data, like finger print reader, and "classic" pin panel. The Emtel data centre provides multiple services and next to co-location for your own hardware they also offer storage options for your backup and archive data in their massive, fire-resistant vault. Very impressive to get to know about the considerations that have been done in choosing the right location and how to set up the whole premises. It should also be noted that there is 24/7 CCTV surveillance inside and outside the buildings. Finally, we were guided into the first server room. And wow, the whole setup is cleverly planned and outlined in the architecture. From the false floor and ceilings in order to provide optimum air flow, over to the separation of cold and hot aisles between the full-size server racks, and of course the monitored air conditions in order to analyse and watch changes in temperature, smoke detection and other parameters. And not surprisingly everything has been implemented in two independent circuits. There is a standardised classification for the construction and operation of data centres world-wide, and the Emtel's one has been designed to be a TIER 4 building but due to the lack of an alternative power supplier on the island it is officially registered as a TIER 3 compliant data centre. Maybe in the long run there might be a second supplier of energy next to CEB... time will tell. 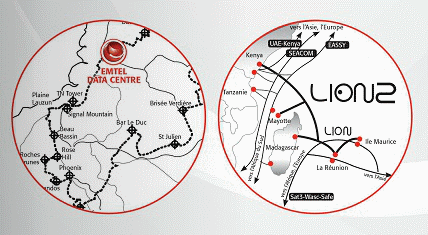 Luckily, the data centre is integrated into the National Fibre Optic Gigabit Ring and Emtel already connects internationally through diverse undersea cable routes like SAFE & LION/LION2 out of Mauritius and through several other providers for onwards connectivity. The data centre is part of the National Fibre Optic Gigabit Ring and has redundant internet connectivity onwards. Meanwhile, Arvin managed to join our little group of geeks and he supported Kamlesh in answering our technical questions regarding the capacities and general operation of the data centre. Visiting the NOC and its dedicated team of IT professionals was surely one of the visual highlights. Seeing their wall of screens to monitor any kind of activities on the data lines, the managed servers and the activity in and around the building was great. Even though I'm using a multi-head setup since years I cannot keep it up with that setup... ;-) But I got a couple of ideas on how to improve my work spaces here at the office. After the completely isolated NOC area we continued our Q&A session with Kamlesh and Arvin in the second server room which is dedictated to shared environments. On first thought it should be well-noted that there is lots of space for full-sized racks and therefore co-location of your own hardware. Actually, given the feedback that there will be upcoming changes in prices the facilities at the Emtel data centre are getting more and more competitive and interesting for local companies, especially small and medium enterprises. After seeing this world-class infrastructure available on the island, I'm already considering of moving one of my root servers abroad to be co-located here on the island. This would provide an improved user experience in terms of site performance and latency. This would be a good improvement, especially for upcoming e-commerce solutions for two of my local clients. Later on, we actually started the conversation of additional services that could be a catalyst for the local market in order to attract more small and medium companies to take the data centre into their evaluations regarding online activities. Until today Emtel does not provide virtualised server environments but there might be ongoing plans in the future to cover this field as well. Emtel is a mobile operator and internet connectivity provider in the first place, entering a market of managed and virtualised server infrastructures including capacities in terms of cloud storage and computing are rather new and there is a continuous learning curve at Emtel, too. You cannot just jump into a new market and see how it works out... And I appreciate Emtel's approach towards a solid fundament and then building new services on top of that. Emtel as a future one-stop-shop service provider for all your internet and telecommunications needs. 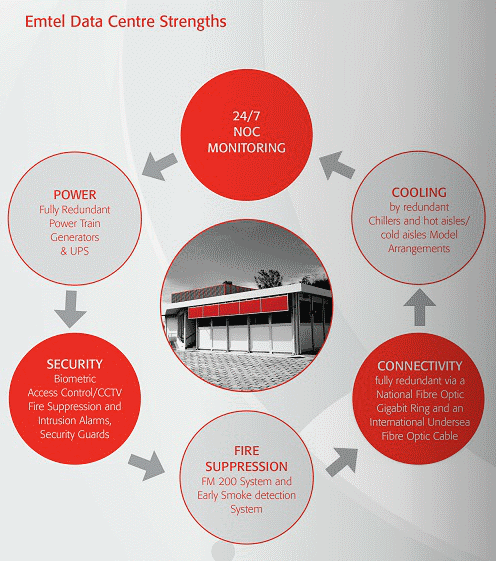 More details are thoroughly described in Emtel's brochure of their data centre. Check out their PDF document here. Visiting and walking through the Emtel data centre for more than 2 hours was a great experience. As representative of the Mauritius Software Craftsmanship Community (MSCC) I would like to thank anyone at Emtel involved in the process of making it happen, and especially to Arvin Lockee and Kamlesh Bokhoree for their time and patience in explaining the infrastructure and answering all the endless questions from our members. Thank You! This time I'm writing some lines on my (and my family's) activities during our long weekend stay on Rodrigues.